There’ve been a lot of haunted houses popping up on screens both large and small lately, including the dreaded 29 Neibolt Street house in It and the trippy centerpiece of Syfy’s Channel Zero: No-End House. That said, spooky houses are a long-running horror staple—and not all are created equal. Here are the ones that scare us the most. Note: These are houses only, so no spooky hotels are on this list (although rest assured, we’ve had plenty of nightmares inspired by the likes of The Shining and The Beyond). Oakland, California’s historic Dunsmuir House has served as the backdrop for several films, including Phantasm and So I Married an Axe Murderer. But its most memorable appearance has got to be its showcase role in 1976's Burnt Offerings, directed by Dark Shadows creator Dan Curtis. The cast is unbeatable (Karen Black, Bette Davis, Burgess Meredith, Eileen Heckart, and an amazingly over-the-top Oliver Reed), and the story is delightfully bizarre, as a dilapidated manse rejuvenates itself by sucking the life out of its latest renters. The creepy smiling chauffeur who recurs throughout the film is just a nightmarish bonus. Based on a book about a hoax haunting cooked up to cash in on a very real mass murder, The Amityville Horror’s sordid backstory is inextricable from the 1979 movie. But the film—which was shot in Toms River, New Jersey, not in the actual Amityville house—is actually plenty eerie, and not because of the “ghost pig” special effects. The great Rod Steiger makes an impression as the priest in the “GET OUT!” scene, and Margot Kidder and James Brolin are also surprisingly effective as new homeowners whose marriage and financial situation are pushed to the brink, thanks to the stresses (supernatural and otherwise) of their troublesome new home. The Amityville series is, incredibly, still spawning fresh sequels, but this is the only entry worth seeking out. The title structure of the ongoing Syfy series initially gives every impression of being a cool pop-up attraction worthy of at least one or two Instagram posts. But the weird black house that suddenly materializes at the end of an exceptionally beige and boring street is not what it appears to be—it has the power to read minds, shape-change, and transport its unluckiest visitors to an alternate dimension... a terrifying alternate dimension. If that wasn’t already implied. This British TV special from 1992—presented as a real, live documentary investigation of an allegedly haunted house—freaked the hell out of gullible viewers who thought they were witnessing the unleashing of an actual evil spirit. Ghostwatch aired years before horror’s love affair with found footage grew tiresome, and of course everyone now knows it was a cleverly executed hoax... but it’s actually still pretty unsettling. Though the show’s biggest gotcha moments happen back in the BBC studio, the starting point for everything is the otherwise unassuming suburban house where the sinister “Pipes” first makes his presence felt. Speaking of found footage, one of the best examples of the technique is this massive hit, which spawned a film series that’s now up to six entries and has its own enveloping mythology. The original film, however, is about as stripped-down as a haunted house movie can possibly get, as a demon grows bolder and bolder in its stalking of a woman and her camera-toting husband in their San Diego home. Has a slowwwwwly closing bedroom door ever been infused with so much white-hot terror? In 1981, Italian horror legend Lucio Fulci (Zombi 2, The Beyond) directed this tale of a NYC family that relocates to a ramshackle house in small-town Massachusetts with a very gruesome history—both recent, in that the most recent owner killed his mistress and then himself, and more distant, thanks to a certain diabolical “Dr. Freudstein,” who lived there 100 years prior and (spoiler!) still lurks in the basement. This is not a slick production—and the most widely-seen version of the film has probably the most distractingly terrible English dubbing ever recorded. But it’s also a Fulci film, which means the gore is outstanding—and the house itself is so creepy, you’ll barely notice the adjacent cemetery. Early in Darren Aronofsky’s zero-fucks-given extended metaphor of a horror movie, we’re shown that the sprawling house that’s been lovingly restored after a fire by a poet’s devoted wife (Jennifer Lawrence) is made up of more than just wood and stone. There’s something alive in its walls, and it has a mysterious relationship to both its inhabitants that borders on codependent. Though the wife character spends most of the movie trying to keep people out, her husband (Javier Bardem) can’t resist letting more and more people in. Without spoiling this recent release, let’s just say that the more the house deteriorates—hey, that sink isn’t braced yet!—the crazier the movie gets. And it gets damn crazy. Psycho author Robert Bloch—certainly an authority on ominous houses—wrote the four stories that were adapted into this 1971 British anthology film. When a movie star goes missing after renting a sprawling country house, the detective on the case begins piecing together the property’s doom-filled past. Each segment of the film reveals a new terror, with genre titans Christopher Lee and Peter Cushing lending extra heft to the gothic goings-on. Despite the presence of vampires and voodoo, at no point do the walls actually drip blood—but if that’s what you’re dying to see, check out the comedy horror short The House That Drips Blood on Alex, which interprets the title way more literally (and has the added bonus of starring The Room’s Tommy Wiseau as the hapless title character). Here’s a particularly gripping example of that old rule about when something appears too good to be true, it probably is. While visiting the picturesque Cornwall coast, brother-and-sister city slickers (Ray Milland and Ruth Hussey) fall in love with a clifftop manse, Windward House. They buy it for an insanely low price, realizing too late it’s not actually empty... because it’s filled with ghosts. The Uninvited is beautifully made (Charles Lang Jr.’s Oscar-nominated cinematography is particularly gorgeous) and it treats the subject of a haunted house with great seriousness—although the 1944 film itself is not without a sense of humor. In this made-for-TV movie, a couple inherits a Victorian mansion and excitedly sets about restoring it to their tastes. The wife, Sally (Kim Darby), soon breaks a cardinal rule of haunted-house renovation, and decides it’d be a great idea to see what’s behind that curiously locked door. Then, despite being explicitly warned against it, she digs into the bricked-up fireplace she discovers in the basement, unleashing a fleet of nasty little goblins who are hellbent on bringing Sally into their fold; their tactics include mind-fuckery, physical terror, and just generally being hideous on the eyes. Should’ve left that fireplace alone, lady. FX’s popular anthology series has settled in many scary places—the Roanoke house was definitely an address to avoid, even without a Blood Moon overhead—but the first season’s Los Angeles mansion is still its most memorable. It’s overstuffed with dark secrets, dead bodies, an array of ghosts, clairvoyants, nosy neighbors, monsters, a baby that’s actually the Antichrist, and so much more, but it’s such an architectural marvel that we’d almost consider moving in anyway. Almost. Young New Yorker Edith (Mia Wasikowska) is swept off her feet by a dashing Englishman (Tom Hiddleston) visting America with his mysterious sister (Jessica Chastain). Impulsively, she marries him and makes the siblings’ tumble-down and definitely haunted Allerdale Hall her new home. 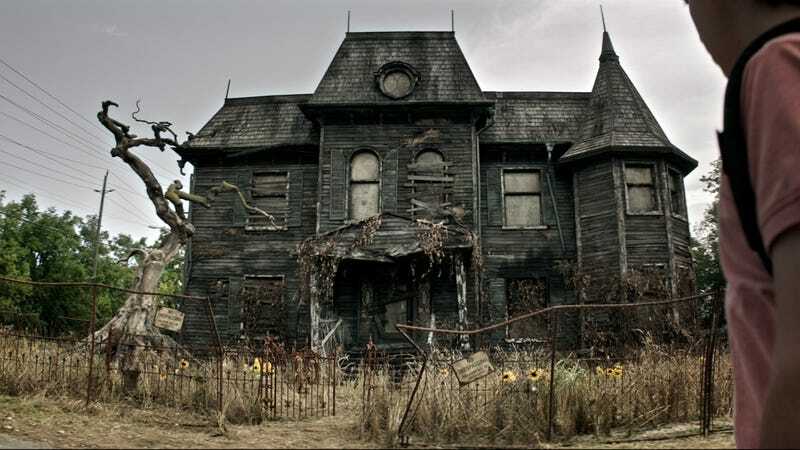 The house itself is a major character in Guillermo del Toro’s dreamy gothic tale, a place where dead leaves drift through the roof’s gaping holes and wispy red ghosts are not shy about making their presence felt. The red clay seeping through the snow in the yard—giving the estate its bloody nickname—is a delightfully gruesome bonus feature. Released at the height of J-horror in 2002 (and later remade in a less-potent American version), Takashi Shimizu’s eerie, suspenseful film is set in an ordinary-looking house that was the scene of brutal crime—and the bad vibes linger in the form of a curse that attacks anyone who dares to enter. Ghosts are generally scary no matter what form they take, but Ju-on’s apparitions (including what’s easily one of the freakiest little-kid ghosts ever committed to film) are truly a cut above. This is one of those scary movies that benefits from multiple viewings. The first time, it’s a nail-biting tale of a widow and her two kids who seem to be living in a haunted house... until the twist at the end reveals that they are the ghosts, they just don’t realize it. On subsequent viewings, the viewer is able to spot the clues that set up the reveal so perfectly—so that’s why the servants act so oddly!—and the setting for this twisty tale couldn’t be spookier: a giant, gothic house perched alone in the misty Channel Islands in the dark months immediately following World War II. Devastated by the car-accident deaths of his wife and daughter, a composer (played by George C. Scott) flees New York City for the outskirts of Seattle. Too bad the creaky Victorian where he attempts to start life anew was the scene of a horrific murder decades earlier... and there’s a pint-sized ghost still hanging around as a result. The old “I died in this house and now I need help getting justice” plot has been done a lot, but it’s especially unsettling here, with a séance scene that leads into a reveal of just how evil the house’s biggest secret really is. This wondrous Japanese oddity from 1977—packed with weird special effects and off-kilter animation—follows a group of schoolgirls who travel to a house in the country. As it happens, it’s a very hungry house (the film was initially inspired by Jaws, of all things), and it’s inhabited by evil spirits, a devious cat, and gruesome delights galore. Beware the piano! Describing the experience of watching House for the first time is nearly impossible—suffice to say, you’ve never seen anything like it before, and you never will again. In between winning multiple Oscars for West Side Story and The Sound of Music, Robert Wise directed this Shirley Jackson adaptation about a group of strangers assembled to investigate the almost-certainly-haunted Hill House, a mansion with nothing but tragedy in its past. Made in 1963, The Haunting has limited special effects (unlike its CG-overloaded 1999 remake), but builds tons of atmosphere with lighting, camera tricks, and mise-en-scène—not to mention outstanding performances from its cast, particularly Julie Harris as a fragile woman whose own dark past makes her especially vulnerable to Hill House’s strange powers. There’s bound to be big trouble when you build a whole suburban housing development over a cemetery in which the headstones were moved, but the bodies were left in place. The Freeling family learns this the hard way, when fun stuff like kitchen chairs moving of their own accord rapidly escalates to the supernatural kidnapping of young Carol Anne. Along the way, tons of other terrifying stuff takes place in and around the property, thanks to the guidance of director Tobe Hooper and producer/co-writer Steven Spielberg: a tree almost eats a kid, a truly awful clown doll comes to life, a guy starts peeling the skin off his face and can’t stop, corpses bob up in the swimming pool, etc. Despite the sunny skies and wide sidewalks, this is not a place you would want to live, or even spend one night. Every small town has a run-down house that looks so scary, kids cross the street to avoid it. The house at 29 Neibolt Street in Derry, Maine might be the ultimate example of that phenomenon, with good reason—even lingering in the yard too long will summon Pennywise the Dancing Clown, always simply delighted to taunt you with your worst fears. The fact that the Losers Club kids dare to enter more than once is a huge testament to their bravery and loyalty, especially considering the horrors they know are lurking within its walls.